Doing really well at home!! Eli has been doing so great! He threw up in the car on the way home Wednesday and several times Wednesday night, but it has been smooth sailing since then. He is now eating everything and keeping it down. He is so super smiley and in such a good mood. He has been so snuggly and loving and giving kisses, which he didn’t do before surgery. He has been really babbly and trying out some new words, although nothing too consistent yet. He also seems to be more into playing with toys, and actually played with a ball appropriately today. It is hard to put into words, but he does seem a little different. There is a curiosity that wasn’t there before, and he just really seems to feel better. If things continue to go this way, I think we are going to start seeing some really big developmental leaps soon. He is also sleeping through the night, all the way to 6am everyday which is sooooo awesome! His incision is healing really well. 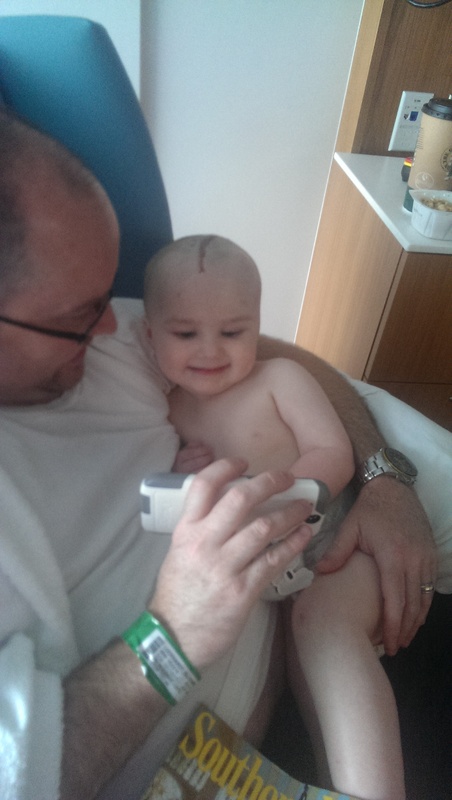 He is still a little wobbly with his walking, but that is improving everyday. Most importantly, we haven’t seen any seizures! It has now been over a week without a seizure which is such a huge blessing. Since this whole nightmare started we have never had this long a stretch without any seizures. We are cautiously optimistic that this might have actually worked. The problem is that I have read enough blogs of kids who have been through this to know that the seizures can return at any time… in a month, in 6 months, in 10 months, or never, you just never know. So, we are trying to just enjoy this time, and hoping beyond hope that they don’t ever come back. Friday, 7 days after surgery, so happy to finally be able to eat! Eli has done a lot better today. He is bright and smiley. And, most importantly he hasn’t vomited today. So we are going home! I am pretty nervous about it, but I think he will do so much better at home. So please pray that he has no more vomiting, his incision continues to heal well and that his seizure frequency at least improves if not stops all together. We appreciate so much all the support, dinners since we have been here and all the prayers and love that have been sent his way over the past few days. We will keep everyone posted on how he is doing. Quick update tonight. We have had visitors today and Evie spent a long time here this afternoon, so I haven’t had much time to post. Eli had a rough start to the day with projectile vomiting around 2am and then again around 6am. 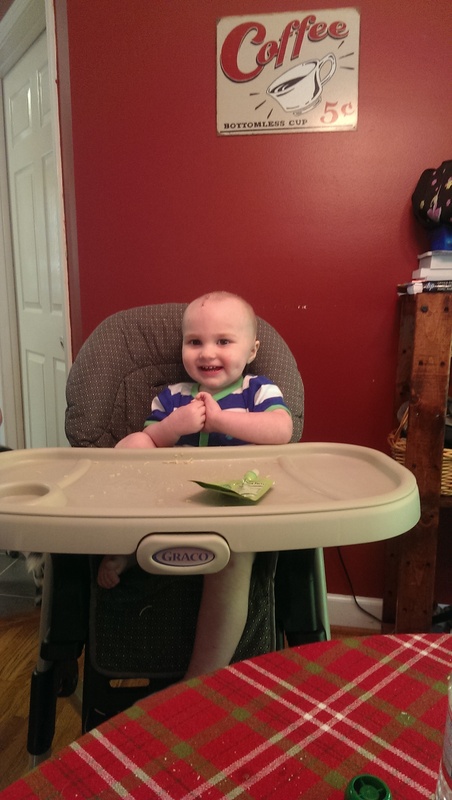 His morning was pretty good and he was able to keep down some cheerios and apple juice. We gave him a little more for lunch and he vomited that all up. The poor kid just can’t seem to keep a lot down 😦 He is back on IV fluids now. 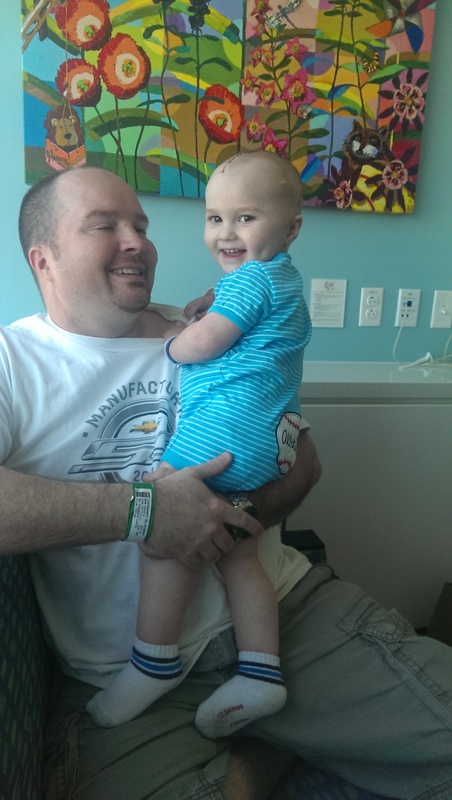 They did a quick MRI this morning to make sure that there wasn’t any swelling or excessive fluid build up (hydrocephalus) and the MRI looked a lot better than his CT scan on Saturday. Most of the air was gone and the swelling was improved. No surprises which was good. We were hoping to go home tomorrow, but he needs to be able to keep his food down. 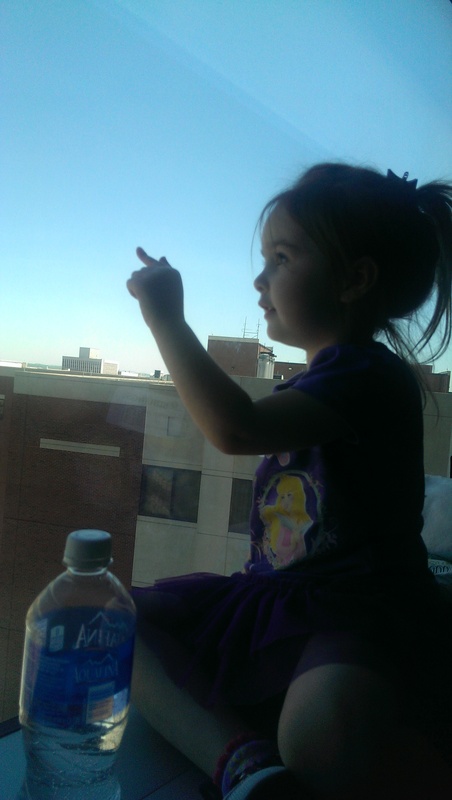 So I am guessing we will have at least one more night in the hospital. The good news is that his mood and personality are getting so much better. Every time he woke up today, he woke up with a smile. We had probably as many smiles today as we had scowls which is a huge improvement! He even giggled a couple of times and some smiles were big enough that we could see his dimples again. Overall though, it is still pretty obvious that he doesn’t feel good, and he really just doesn’t tolerate being moved around much. I think we are definitely making progress. We really just need the vomiting to stop. Eli is a little better today. He slept well last night. He woke up at 5am with a massive, blow-out poop. Since it had been a week since he pooped, this was more than welcomed. Unfortunately, he seems to have a little diarrhea and has had several more poops today. He vomited a little this morning, but has done better throughout the day. He has kept down clear liquids and some cheerios and crackers. His swelling is a lot better today. We are also able to pick him up and move him around today without vomiting which is definitely an improvement. The best news is that we have gotten a couple of quick smiles from him today with a couple of quick glimpses that my kiddo is in there. He has still had a lot of zoned out time today, but all in all, I think we are starting to see improvements. Hopefully tomorrow will be an even better day. Not too much to report today. I think he is a little better today. He has definitely been awake more today, but he still just kind of lays around and is not really interactive with us. I still haven’t seen my Eli yet 😦 He did play briefly with a couple of toys, but overall still seems miserable. He is still vomiting whenever we move him. The surgeons think he might still have an air pocket in the space where they resected his lesion. That space will eventually completely fill with spinal fluid, but until it does, the fluid can kind of slosh around and make him feel bad, dizzy and nauseous. They removed his bandages this morning, so we got our first look at his incision. Overall it was better than I expected, and I think it looks really good. We had a few Easter visitors. Mom brought Evie up and we got to give her Easter basket to her. Eli seemed to be happy that she was here and to enjoy some Granny time. Evie did really well, and sat and talked with him for a little while. Cherie and Parker also visited and brought us some yummy Easter BBQ. Tonight he seems to be resting comfortably. The swelling of his left eye is much improved, but he only wants to lay on his right side, so now his right eye is really swollen along with his right hand. Hopefully tomorrow he will tolerate being upright a little more so some of the swelling should start to improve. They say the swelling peaks at 48-72 hours and then he should start to feel better. He has tolerated us holding and cuddling him today which has been nice. Things have not gone nearly as smoothly the second time around. Don’t get me wrong, Eli is doing fine, it is just another ball game when they take out part of the brain. He slept most of the night thanks to several doses of morphine from the nurses. He went for a CT scan around 6am this morning and luckily that was fine. 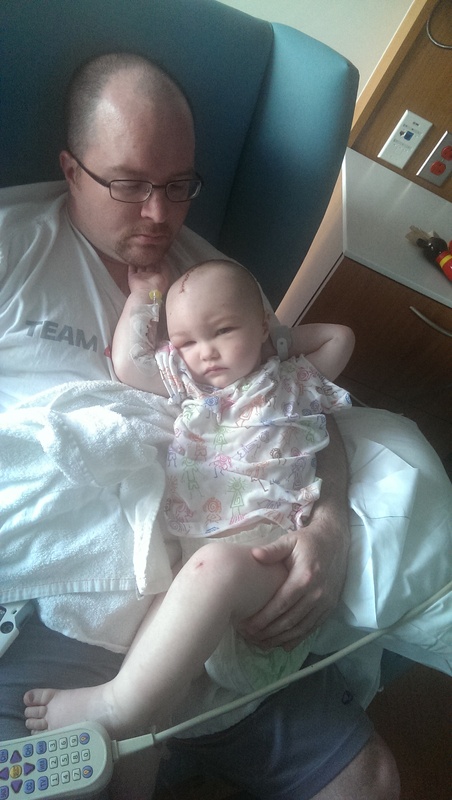 Part of brain they expected to be missing was gone and there were no bleeding or swelling or anything unexpected. Throughout the night he had a lot of twitching and jerking that would often wake him up from sleep. This had me worried. He also would wake up and just sort of look around with a dazed expression on his face. He wasn’t interacting with us at all. I was really upset about this, but everyone keeps assuring me that this is normal. Around 9am he was awake so we tried to give him some water/juice. He guzzled 4oz. I kept trying to get the bottle away so that he wouldn’t take it so fast, but he had a death grip on the bottle and downed the whole 4oz. Then he quickly proceeded to projectile vomit about 3x that much all over me. We got cleaned up and then he went back to sleep for a while. Around 10:30am, he suddenly woke up and sat up. Then he stood up and tried to get to me, and then proceeded to have a seizure. 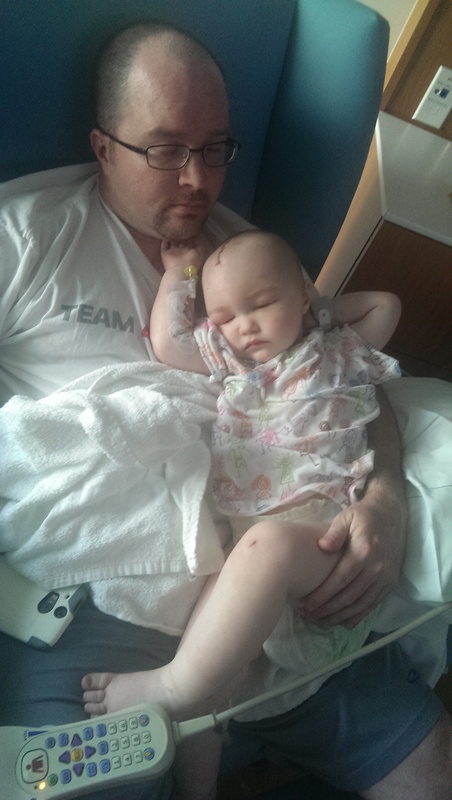 It was a typical cluster seizure like we see everyday, except there was less head dropping. It lasted about 3 minutes and sent me into a tail spin. 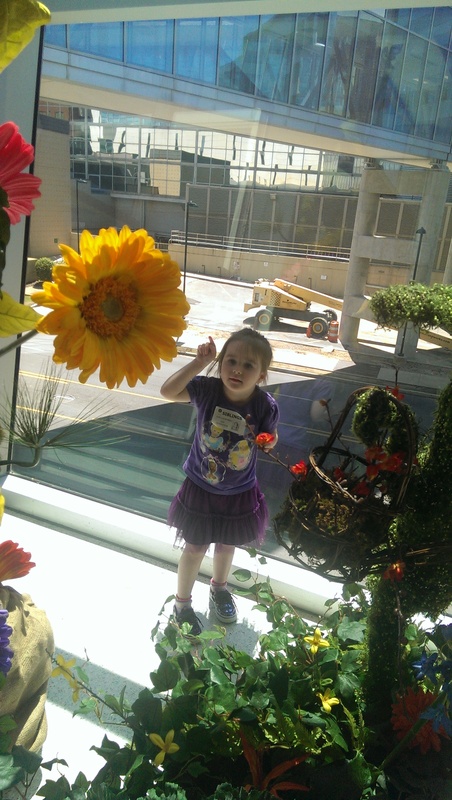 I am not really sure why, since we expected that there was a good chance we would see post-operative seizures that would diminish over time, but I guess you always hope that this was the magic solution. This made worse by the fact that we were in PICU and not the epilepsy unit, so no one had any idea what to do. The nurses and residents kept trying to check his pupils which was driving me crazy. And, they kept asking if I was sure it was a seizure because they didn’t see anything and his vitals were fine. Thanks very much, but after 100s of daily seizures for 6 months, I am pretty sure I know what I am talking about. This was followed by the pediatric critical care attending coming in and basically standing there for 5 minutes nearly silent and just every now and then say, “Oh, sorry. I don’t know what this means”. Thanks, but can someone please get someone in here who knows something, ahhhhh!!!! Finally, our neurologist, Dr. Goyal showed up. By this time, I was pretty upset and over-emotional. She reiterated what we had talked about yesterday. He was immediately post-op, we know that the temporal lobe is still having discharges, there is a lot of swelling and post-op change going on his brain and this is to be expected. We have no idea what this means for his long-term seizure control, it is really just too early to tell. She said it could mean that there is an ongoing seizure focus in the temporal lobe, but she is still very hopeful that with time, his seizures are going to slowly go away as the brain calms down. My other worry this morning was that he just seemed so different than after his first surgery, so much less interactive and so dazed. She reminded me that he had just had part of his brain out and that this is to be expected. I have really been second guessing as to whether we made the right decision and whether this was the best option for him. She squashed those thoughts really quick. She said the area that they removed was very abnormal. It was hard, rubbery and calcified. We know from the grid mapping that when he had seizures, it was the first area that activated, meaning that it was likely driving his seizures. It is also possible that there is abnormal tissue in the temporal lobe that now that the frontal lesion is gone, will start driving seizures, but we won’t know that for some time. I guess about 50% of patients who eventually become seizure free after resective surgery have post-operative seizures. So now we just watch and see. This conversation involved a lot of tough love for momma. She basically told me that I had to get control of my emotions, that this is going to be a long journey with a lot of wait and see, and I am going to need a lot of strength and energy to get through it. She said if I keep going with this amount of anxiety and negativity that I am going to burn out. The brain is a funny organ and it is so hard to understand. There is no black and white and every epilepsy case is so unique. There is no way to predict what the outcome of any of this is going to be, which is so hard for me. So basically, I need to work on just going with the flow and taking each step as it comes. Things have been better for me this afternoon. Tough love actually works for me, and I have been feeling much calmer. He has been sleeping most of the time, but wakes up intermittently. He is still not very interactive, but he is making a little more eye contact this afternoon. He even smirked a little at daddy, when he was doing peek-a-boo with him. It was brief but it was real. 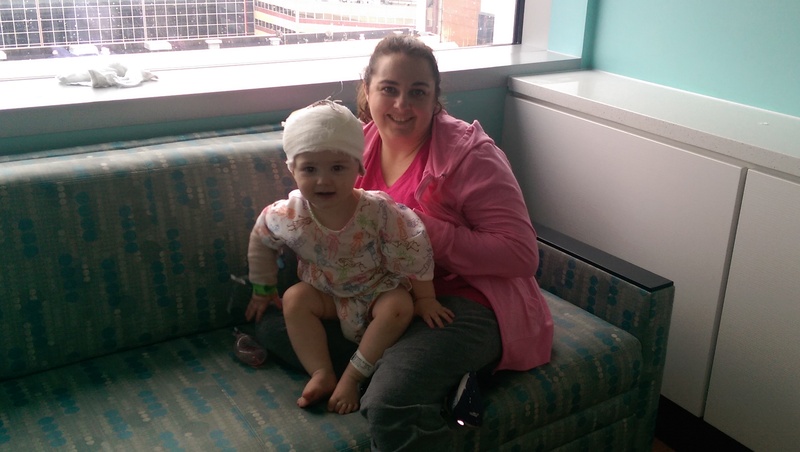 We are now back in the epilepsy monitoring unit, which is more familiar and helps us feel more secure. He just seems so sad and even angry. He seems to be twitching less and not jerking himself out of sleep as much, so maybe that was the anesthesia effect. He did have another episode of vomiting this afternoon. Maybe tomorrow he will tolerate oral intake a little better. His poor left eye is now swollen almost completely shut and is a little bruised. He just looks so pitiful. The good news is that his vital signs are great, he is not requiring oxygen, he is peeing great. So maybe tomorrow all the other stuff will start to improve as well. So we are in the ICU with Eli and he seems to be doing well. His vitals are stable. He has been mostly sleeping since he got back here. He has woken up a couple of times and tried to sit up, but he doesn’t seem to recognize us yet. He is moving everything and seems pretty comfortable. I am having a rough time tonight. 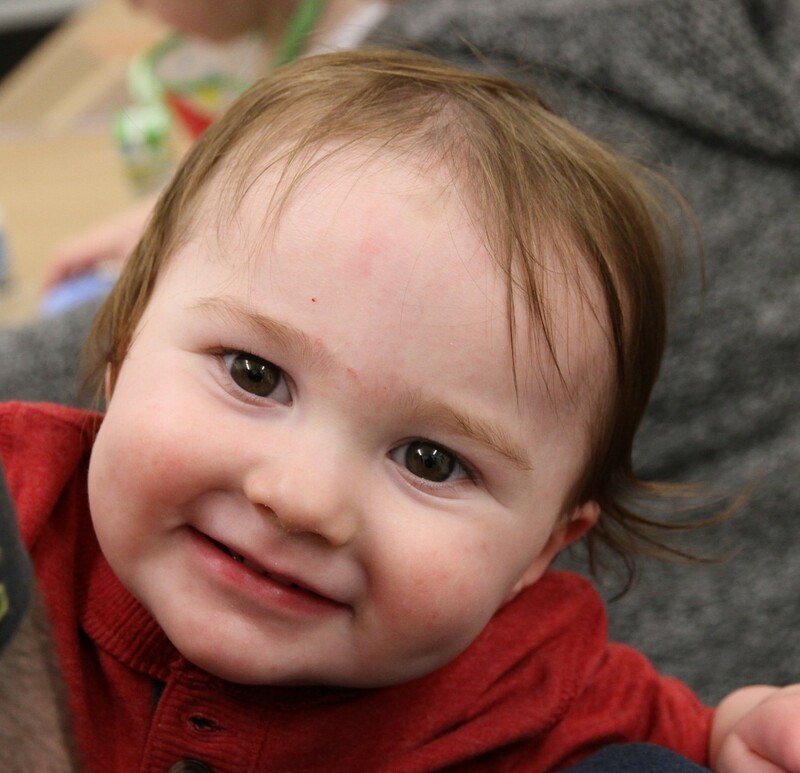 I am feeling very guilty that I let someone take out part of my baby’s brain and I am so scared that this will irreversibly change my sweet little man in some way. Please keep us in your thoughts and prayers. I will update again in the morning. 1) The felt that the temporal lobe might still be irritated from having had the abnormal electrical activity from the frontal lobe for so long, and that with time it would calm down. They said they have seen this before, called the “running-down phenomenon”. We could stop with resecting the lesion and watch for seizures and see if the temporal lobe activity resolves over the next few months. If it doesn’t then we would have to do more investigation into the temporal lobe and might have to do another resection at a later date. 2) We could go ahead and resect part of the temporal lobe. The problem with this is that they don’t know exactly where in the temporal lobe the seizure activity is coming from, and they also don’t know if we would be resecting normal tissue that just needed time to reset itself. 3) We could put more grids and electrodes in at this time, and continue to monitor and watch for seizures for another week to see if there is a spot in the temporal lobe that needs to be resected. We chose to option #1. He clearly had an abnormality in the frontal lesion that was clearly causing seizures, and the temporal lobes looked normal on MRI. We don’t want to remove part of his brain if there is nothing wrong with it and there is a chance that it might get better over time. Obviously this puts him at risk for having to have another surgery at a later date, but we are going to really hope that won’t be necessary. This was also the option that both our neurologist and neurosurgeon felt most comfortable with. There is also the possibility that with the lesion gone that medication will work better at controlling seizures if they persist in the temporal lobe. So they are closing him up right now and we are just waiting to hear that he has gone back to recovery. Overall, not the exact news we wanted to hear, but we remain hopeful that we will get seizure control. I will post later once we see him after recovery. They just took Eli back to start his second surgery. 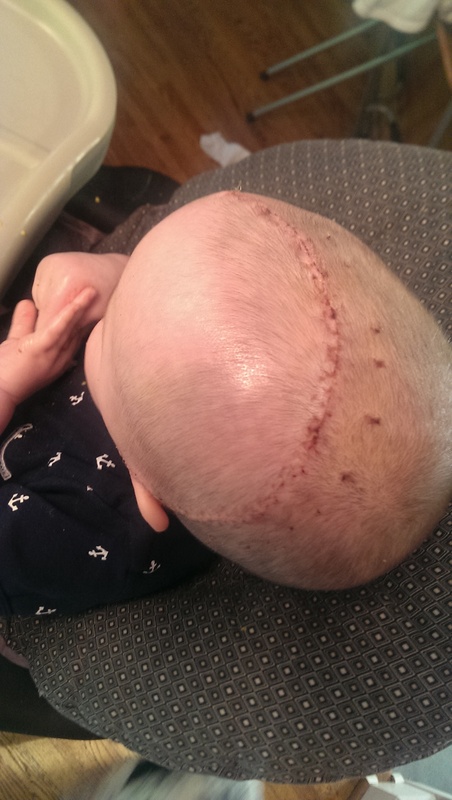 His neurosurgeon was expecting it to take 2-3 hours, depending on how long the intra-operative EEG monitoring takes. 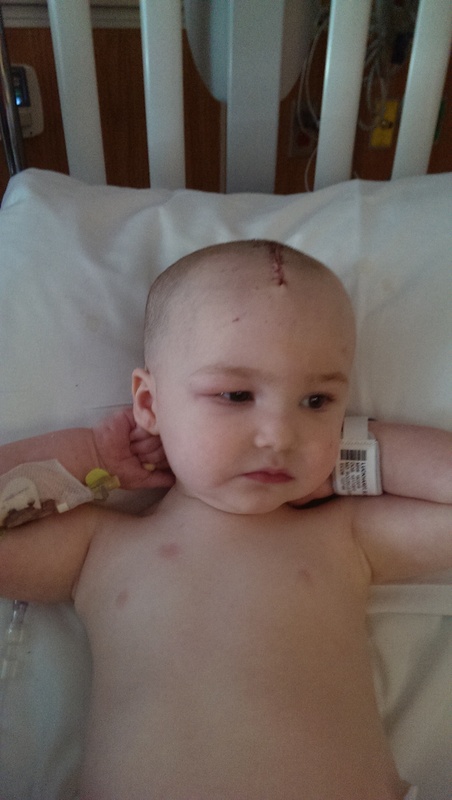 He was doing pretty well this morning, and was so happy to have his head unhooked from all the monitoring equipment. He was back to being my little monkey boy, climbing all over the couch. I will keep everyone posted throughout the day. Eli is doing really well. He slept a little better last night, although he did have some vomiting around midnight. He is such a trooper. He has only been getting Tylenol and ibuprofen around the clock for pain and he seems pretty comfortable. He just really hates having all this stuff attached to him. It is so hard for him to move around and for us to position him. He has tried to get up and walk a couple of times today, but it is just so hard for him with all the wires hanging off his head. He is still pretty wobbly too. He was in a really good mood this afternoon, but got tired out pretty quickly. He did eat some dinner which was great! The reason we did the intracranial mapping was that the doctor’s felt pretty confident that his seizures were coming from a lesion in his left prefrontal cortex (very front of his brain on the left side). But, his scalp EEG showed that his seizures were occurring everywhere, not just in that one area (generalized, not focal). They think that is because his brain is so small and still developing, so the seizures just spread very quickly throughout the whole brain. What was concerning them though was that the strongest spikes seems to be coming from the left temporal lobe (side of the brain) and not the left frontal lobe. Also his PET scan was a little confusing. Areas of the brain that cause seizures on PET have very little metabolic activity and show up as blue areas, whereas the rest of the normal brain is shades of red/orange/yellow and some green. His lesion was very dark blue showing that there was almost no metabolic activity, which was good. This meant that this was most likely the area causing the seizures. But, the most anterior part of both of his temporal lobes was also a very light blue. This along with the EEG showing the strongest spikes in that area, made them concerned that the temporal lobe could also be contributing to the seizures. The gut feeling of the doctors was that the lesion in the frontal lobe was actually driving the seizures and that they were just spreading very quickly to the temporal lobes, but it was impossible to confirm this with the non-invasive testing. That is why we had to do the first part of this procedure to see which area was actually causing the seizures. They put electrodes all over the left frontal lobe and left temporal lobe, and that is what they have been monitoring the past 2 days. 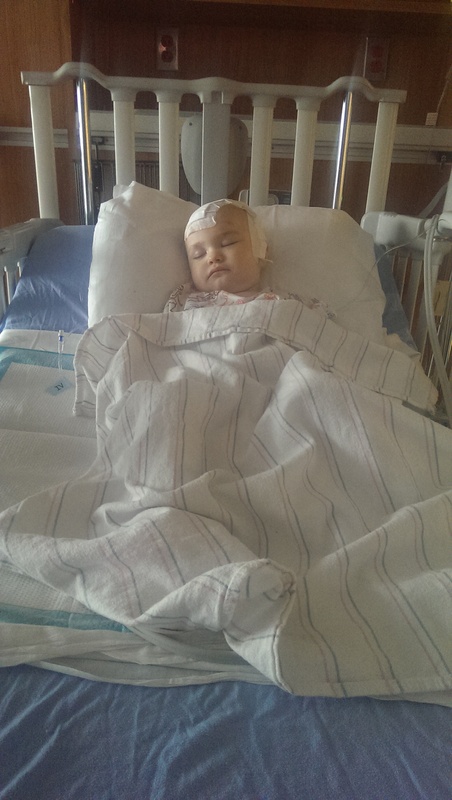 So they spent all day mapping his electrical activity in his brain during and after seizures. They definitely think that the lesion in the frontal lobe is driving the seizures. They are still seeing activity in the temporal lobe, but it seems to lag behind the activity in the frontal lobe. So they are going to resect the lesion in the frontal lobe tomorrow, meaning they will resect his left prefrontal cortex and left orbitofrontal cortex. 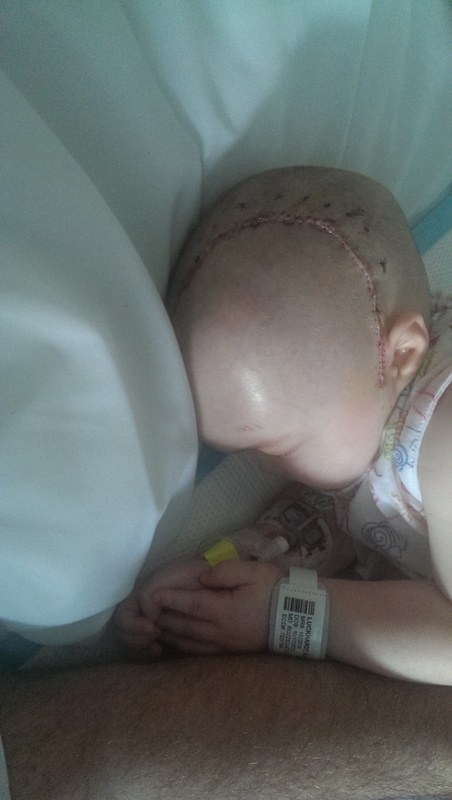 Then after they have removed the part of the brain with the lesion, they will put electrodes on the brain around where they resected and in the anterior temporal lobe to see if there is any seizure activity left. They expect that once the lesion is gone, that they will not see anymore seizure activity in the left temporal lobe. But, if after removing the lesion, there is still seizure activity in the left anterior temporal lobe, then they will remove that as well. They don’t expect any deficits with any of these resections. They will be far away from the motor strip and the speech areas. They will not be touching the mesial temporal lobe which is where memory is involved. Sorry, I know that was a long, technical explanation. But basically they have a plan for resection of the front part of his brain on the left and then if there is still seizure activity in the other lobe that they are worried about, they will remove that one as well. It will be another long surgery day. He will be gone from us for most of the day tomorrow as well. We are unbelievably scared. Everyone has been so wonderful. The support and outpouring of love has been humbling. Please keep praying for him and keeping positive thoughts that this will work.